Montclair State University faculty, staff or students may charter buses for their department or organization to travel on University business. Ideally, requests should be made three (3) weeks before the trip. Requests for estimates may be made no earlier than two months prior to the desired service date. The size of your group. The size of your group will determine the type and number of vehicles that will be used. Be sure to include chaperones/bus captains – every person must be assigned a seat. For the safety of our passengers, no standees are permitted on charters for any reason. The duration of the reservation. For the length of reservation please take the amount of time you need and add 30 minutes before and 30 minutes after that time to allow for inspection, preparation, and cleanup of the bus. The point of origin, and destination. If traveling to/from points off campus, exact addresses are required in order to make the reservation. Unscheduled stops along the route are not permitted. The contact person and contact information. The designated contact person should be available on the day(s) of the charter in case any issues arise, and should have authority to resolve said issues. If the contact person is not going to be going on the charter, the hiring party will provide a bus captain to be in charge of the group. Appropriate chaperones should be provided by the hiring party on overnight trips. After Shuttle Services receives your request, they will provide you with a contract that details the number and type(s) of vehicles to be used (depending on the size and activity of the group), the service to be provided, and the estimated total cost. You must sign and return this contract at least ten (10) business days before the requested date of the charter to confirm the charter service. Contracts are accepted Monday through Friday during normal business hours. Service can not be provided if a signed contract is not received or if the requester does not hold authority to charter. An invoice will be sent to the customer within two (2) business days after a charter. 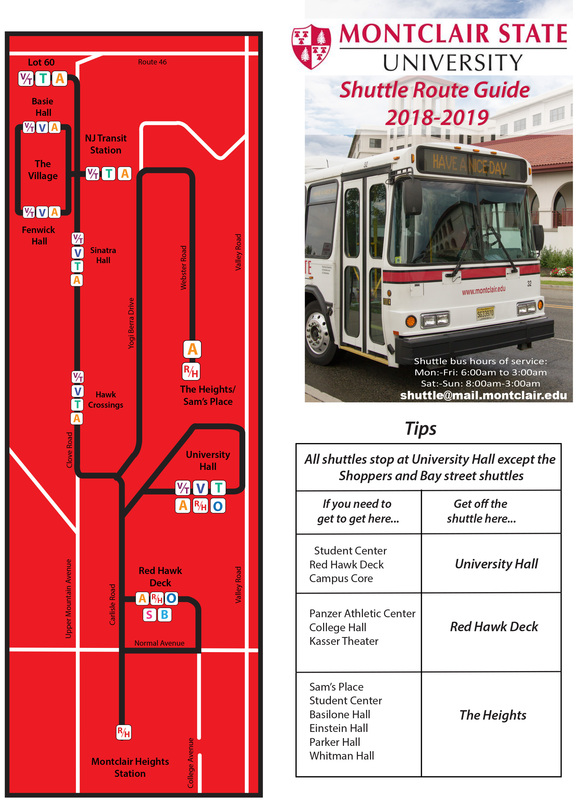 Payment may be made by Montclair State University Transfer of Expense Form (preferred method), or a check made payable to Montclair State University – Shuttle Services. There is a minimum charge of $180 (three (3) hours @ $60/hour), which includes one (1) hour for the Federally-mandated pre-trip and post-trip bus inspections. Charter hours billed will be the calculated total of inspection, cleaning, running, and layover times. If the buses require additional cleaning after a charter, the charges will be billed to the customer. Lodging for the driver(s) on overnight trips, parking fees, tolls, highway permits, and any other incidentals are the responsibility of the hiring party. Any changes to be made to the charter contract must be submitted in writing to the Shuttle Services. If there is time added to or subtracted from the duration of the charter, adjustments will be reflected on the contract. Requests for changes may be submitted via e-mail, USPS, or fax (973-655-3126). Cancellations made with less than two (2) business days’ notice will be billed the three hour minimum as a cancellation fee. Cancellations made less than two (2) hours before scheduled start of the charter will be billed for the scheduled duration of said charter. Any chartering party deemed a “no show” for their charter will be billed for the scheduled duration of said charter. There is no penalty if a charter is canceled with more than two (2) business days’ notice. All cancellations must be submitted in writing with the signature of the Representative, Dean, Director or their Designee and will be confirmed by Shuttle Services. Smokes or possesses open alcoholic beverages. Violates either of the University’s polices regarding Employee or Student Conduct. Engages in any behavior that limits the driver’s ability to drive, or threatens the safety of passengers. Absolutely no smoking or open alcoholic beverages will be permitted on any bus at any time. Drivers are instructed to wait for passengers for up to 30 minutes from the pickup time on the contract. When chartering more than one bus, the buses will travel as a group whenever possible. Shuttle Services cannot guarantee that charters can continue more than one hour beyond the arranged end time, or past 2:00 AM.